Not to be confused with Everybody's Talking. This article is about the song. For the album known by the same name, see Fred Neil (album). For another album, see Everybody's Talkin' (Tedeschi Trucks Band album). "That's the Bag I'm In"
(1968) "I Will Take You There"
"Everybody's Talkin'" is a song written and recorded by singer-songwriter Fred Neil in 1966. A version of the song performed by Harry Nilsson became a hit in 1969, reaching No. 6 on the Billboard Hot 100 chart and winning a Grammy Award after it was featured in the film Midnight Cowboy. The song, which describes the singer's desire to retreat from other people to the ocean, is among the most famous works of both artists, and has been covered by many other notable performers. The song later appeared in the 1994 film Forrest Gump and is also on the film's soundtrack album. It also appeared in the comedy film Borat, on The Hangover Part III soundtrack, in the English television show Black Books, the action comedy film Crank, and in the Only Fools and Horses episode "The Jolly Boys' Outing". The song was first released on Neil's second album, the self-titled Fred Neil, released in early 1967. It was composed towards the end of the session, after Neil had become anxious to wrap the album so he could return to his home in Miami, Florida. Manager Herb Cohen promised that if Neil wrote and recorded a final track, he could go. "Everybody's Talkin'", recorded in one take, was the result. Toby Creswell of 1001 Songs noted that the song had parallels to Neil's later life—like the hero of Midnight Cowboy, he looked "for fame to match his talents, discover[ed] that success in his profession isn't all its cracked up to be" and wanted to retreat. Five years later, Neil permanently fulfilled the promise of the speaker in the song, rejecting fame to live the rest of his life in relative obscurity "where the sun keeps shining / thru' the pouring rain" in his home in Coconut Grove, Miami. 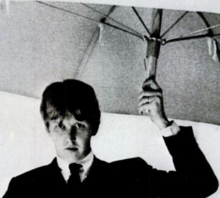 Harry Nilsson was searching for a potentially successful song when Rick Jarrard played the track for him, and he decided to release it on his 1968 album Aerial Ballet. When released as a single in July 1968, it managed to reach only No. 113 on the Billboard Bubbling Under the Hot 100 chart. After the song was featured as the theme song in the film Midnight Cowboy in 1969, the song was re-released as a single and became a hit, peaking at No. 6 on the Billboard Hot 100 chart and No. 2 on the Billboard Easy Listening chart. When Derek Taylor recommended Nilsson for the Midnight Cowboy soundtrack to director John Schlesinger, Schlesinger selected "Everybody's Talkin'", preferring the cover to the song Nilsson proposed, "I Guess the Lord Must Be in New York City". 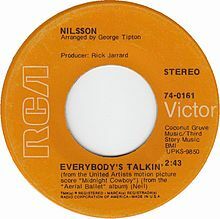 The song was used as the theme song for the movie and became closely identified with it; Nilsson's cover is also known as "Everybody's Talkin' (Theme from Midnight Cowboy)". William J. Mann, in his biography of Schlesinger, noted that "one cannot imagine Midnight Cowboy now without 'Everybody's Talkin'". Described in The Rock Snob*s Dictionary as an "anti-urban plaint", "Everybody's Talkin'" depicts the introverted speaker's inability to connect with others. Not hearing or truly seeing them, the speaker declares an intention to leave for the ocean and the summer breeze. AllMusic's Denise Sullivan describes Neil's version as "positively spooky and Spartan" by comparison to Nilsson's better-known cover, whose arrangement she felt captured the "freedom, shrouded in regret and loss, implied in the lyric". Nilsson's single for the song sold over a million copies and charted on both Billboard's Adult Contemporary and Pop Singles charts, reaching numbers 2 and 6 respectively in 1969. Nilsson's single also won a Grammy that year. The song became a global success and was followed by international appearances by Nilsson to perform it. Although Nilsson himself denied that the song made him successful, 1001 Songs indicates that the hit "made Nilsson a superstar," exposing him to a much broader fan base and altering his reputation from solely that of a songwriter to a singer. After Nilsson's death, Billboard noted that Nilsson remained popularly remembered for his covers of "Everybody's Talkin'" and "Without You". Neil, too, is largely remembered for this song. But although Neil's second album was re-released in 1969 under the title Everybody's Talkin' in order to capitalize on the success of the song, Neil himself shunned the limelight, retiring from the industry after his final album in 1971 to live quietly in the Florida Keys with the millions of dollars he is estimated to have earned on royalties from the song. In keeping with the song's position in the works of both artists, it has been used to title several "greatest hits" compilation albums—a 1997 release by BMG, a 2001 release by Armoury and a 2006 release by RCA for Nilsson and a 2005 release for Neil by Raven Records entitled Echoes of My Mind: The Best of 1963–1971. The song is highly regarded in the industry, having become a standard. Songwriter Jerry Leiber described it as "a very strange and beautiful song", among the "truly beautiful melodically and lyrically" songs by Fred Neil, who was described by Rolling Stone as "[r]eclusive, mysterious and extravagantly gifted". A 2006 article in The New York Times characterizes the song as "a landmark of the classic-rock era." The song's popularity has proven persistent; through 2005, according to figures from Broadcast Music Incorporated reported in The New York Times, the song had aired on radio and television 6.7 million times. In 2004, the song was listed by the American Film Institute as #20 in its "top 100 movie songs" for the first 100 years of film. Harry Dean Stanton described "Everybody's Talkin'" as "a heroin song" which he claimed was "inspired by Luke Askew, an actor." Since Nilsson's version of the song achieved chart success, the song has been covered by many other artists—almost 100 as of 2006. The more notable artists include Stevie Wonder, Iggy Pop, Willie Nelson, Neil Diamond, Liza Minnelli, Tony Bennett, Luna, Bill Withers, Madeleine Peyroux, Louis Armstrong, Leonard Nimoy, Julio Iglesias, Lena Horne, Harold Melvin and the Blue Notes, the Beautiful South, Crosby, Stills & Nash and Gregory Isaacs (under the title "Echoes"). Nilsson's version was sampled in 2002 by Paul Oakenfold on "Starry Eyed Surprise" and in 2004 by the Go! Team on "Everyone's a V.I.P. to Someone". ^ Erlewine, Stephen Thomas. "Harry Nilsson – Everybody's Talkin' [BMG]". AllMusic. Retrieved September 15, 2017. ^ a b c d e f Browne, David (2006-09-24). "The echoes of his mind just keep reverberating". The New York Times. Retrieved 2009-04-06. ^ a b c d e Creswell, Toby (2006). 1001 Songs: The Great Songs of All Time and the Artists, Stories and Secrets Behind Them. Thunder's Mouth Press. p. 38. ISBN 1-56025-915-9. ^ Neil, Fred. "Everybody's Talkin'". ^ a b Shea, Stuart (2002). Rock & roll's most wanted: the top 10 book of lame lyrics, egregious egos, and other oddities. Brassey's. pp. 77–78. ISBN 1-57488-477-8. ^ Unterberger, Richie (2000). Urban spacemen and wayfaring strangers: overlooked innovators and eccentric visionaries of '60s rock. Hal Leonard Corporation. p. 267. ISBN 0-87930-616-5. ^ a b Sullivan, Denise. "Everybody's Talkin'". AllMusic. Retrieved 2009-04-06. ^ Bronson, Fred (2003). The Billboard Book of Number 1 Hits: The Inside Story Behind Every Number One Single on Billboard's Hot 100 from 1955 to the Present (5 ed.). Billboard Books. p. 307. ISBN 0-8230-7677-6. Nilsson had submitted his own song for the Dustin Hoffman—John Voigt film, but the producers preferred the Neil tune. Undaunted, Harry released "I Guess the Lord Must Be in New York City" as his second single, and it peaked at 34 in November 1969. ^ a b Mann, William J. (2005). Edge of midnight: the life of John Schlesinger. Watson-Guptill Publications. p. 331. ISBN 0-8230-8366-7. ^ Larkin, Colin (1992). The Guinness encyclopedia of popular music. 3. Guinness Pub. p. 1800. ISBN 1-882267-03-6. ^ Ferguson, Gary Lynn (1995). Song finder: a title index to 32,000 popular songs in collections, 1854–1992. Greenwood Publishing Group. p. 92. ISBN 0-313-29470-4. ^ Kamp, David; Steven Daly (2005). The rock snob*s dictionary: an essential lexicon of rockological knowledge. Random House, Inc. p. 76. ISBN 0-7679-1873-8. ^ "Harry Nilsson, Billboard Singles". Allmusic. Retrieved 2009-04-06. ^ "Harry Nilsson, GRAMMY Awards". Allmusic. Retrieved 2009-04-06. ^ Simpson, Paul (2003). The Rough Guide to Cult Pop: The Songs, the Artists, the Genres, the Dubious Fashions. Rough Guides. p. 148. ISBN 1-84353-229-8. ^ "Harry Nilsson dies at age 52". Billboard. Nielsen Business Media, Inc. 106 (5): 110. 1994-01-29. ISSN 0006-2510. ^ a b c Brackett, Nathan; Christian David Hoard; Rolling Stone Magazine (2004). The New Rolling Stone Album Guide: Completely Revised and Updated (4th, revised ed.). Simon and Schuster. pp. 572–573. ISBN 0-7432-0169-8. ^ Nason, Pat (2004-06-23). "AFI's top 100 movie songs". UPI Perspectives. Archived from the original on October 16, 2012. Retrieved 2009-04-06. ^ Huber, Sophie (Director) (2012). Harry Dean Stanton: Partly Fiction (Documentary). US. ^ a b c d e f Whitburn, Joel (2015). The Comparison Book. Menonomee Falls, Wisconsin: Record Research Inc. p. 367. ISBN 978-0-89820-213-7. ^ "Nederlandse Top 40 – Diana Ross & Lionel Richie" (in Dutch). Dutch Top 40. Retrieved December 8, 2018. ^ "flavour of new zealand – search listener". Flavourofnz.co.nz. Retrieved 2016-10-02. ^ Whitburn, Joel (1993). Top Adult Contemporary: 1961–1993. Record Research. p. 177. ^ "The Irish Charts – Search Results – Everybody's Talkin'". Irish Singles Chart. Retrieved March 19, 2019. ^ "Notowanie nr648" (in Polish). LP3. July 15, 1994. Retrieved March 19, 2019. ^ "Official Scottish Singles Sales Chart Top 100". Official Charts Company. Retrieved March 19, 2019. ^ "Official Singles Chart Top 100". Official Charts Company. Retrieved March 19, 2019. ^ "Item Display – RPM – Library and Archives Canada". Collectionscanada.gc.ca. Retrieved 2016-10-02. "You Keep It All In"
"I'll Sail This Ship Alone"
"Old Red Eyes Is Back"
"Good as Gold (Stupid as Mud)"
"How Long's a Tear Take to Dry?" This page was last edited on 11 April 2019, at 12:51 (UTC).